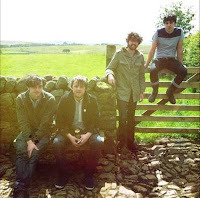 Bluebird Kid Clark were one of Manchester's best kept secrets when releasing three albums between 2006 and 2012. Having taken a four-year hiatus whilst Dave Fidler pursued a solo career, they've been cajoled back into the studio to record new songs for Scruff Of The Neck Records, the first product of which is their new single Not The One. Bluebird are currently operating as a four-piece with brothers Dave (guitar and vocals), Andy (drums and vocals) and Rob Fidler (guitar) and Sion Fitton (bass and vocals). Their love of Americana is very evident in both the guitar sound of the track as well as in the way they interchange and interweave vocals to stunning effect. The song comes from a session last summer after the band reunited to play Headlander Festival and Manchester Food And Drink Festival which also spawned more material that has the same exciting fresh vibe to it whilst seeped in the music that they grew up listening to. Such was the excitement about them reforming that their December Deaf Institute show sold out, no mean feat for a band that hadn't released a song for four years. The set featured both new songs and tracks taken from their three LPs - Bottom Dollar, The Red Squirrel Revival and Live At The Weirworks. Bluebird Kid Clark launch the single with a series of live dates in February at Cargo in London (18th) and Manchester Night And Day (19th). Bluebird Kid Clark are on Facebook and Twitter.